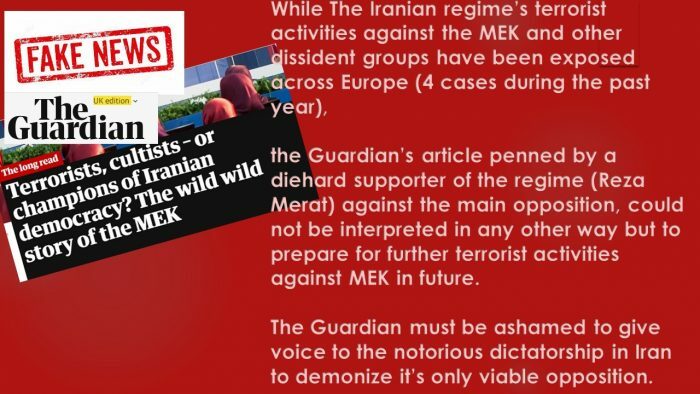 Following the Guardian’s publication of Aaron Merat’s article attacking the main Iranian opposition, the People’s Mojahedin Organisation of Iran (MEK), the Iranian resistance and its allies lined up to condemn the piece. "The Guardian Demonises #Iran’s Democratic Opposition to the Benefit of the Ruling Regime"
The British newspaper published the 3-page piece on Friday, November 9th. It targeted the MEK and its allies and spouted the regime’s lies and falsehoods to demonize Iran’s political opposition. Aaron Merat is far from an impartial journalist. He has close ties to the Iranian regime and has an extensive history of publishing articles sympathetic to the Islamic Republic and attacking its political opponents. Struan Stevenson, the Coordinator of Campaign for Iran Change and former member of the European Parliament (MEP), wrote an open letter to the Guardian expressing his concerns over the article’s publication. He challenged the assertions in Merat’s article and said they had been “lifted directly from the Iranian Ministry of Intelligence (MOIS). Stevenson’s letter questioned Merat’s ability to perform objective journalism on the subject. “He lacks the minimum journalistic standards regarding the issue of the Iranian regime and its opposition. His interviews and opinions during the run-up to the “presidential election” of the clerical regime, as well as his articles and tweets against the PMOI [MEK] are available and well-publicized”, he wrote. He also called the article’s allegations, “so wide of the mark that it brings to mind Voltaire’s statement: ‘those who can make you believe absurdities can make you commit atrocities’”. Merat’s ties to the Iranian regime were evident in the manner in which he carried out research for his article. Merat visited the MEK’s residence in Albania in August. Two MOIS agents reported extensively on the visit, indicating that they had received a copy of Merat’s notes. On the day Merat’s article was published on the Guardian site, the article was also translated within hours and posted across regime-controlled websites. This also indicates that Merat had provided the MOIS with a copy of his article prior to publication. The article, for all of its lies and falsehoods, does offer a glimpse into one aspect of Iran’s political climate. It demonstrates the mullahs’ fear of the MEK and its need to vilify and demonise the group internationally. The MEK played a major role in the organisation and execution of the nationwide protests in December and January, a role that was acknowledged by the regime’s Supreme Leader. The MEK also enjoys extensive support across Europe and the United States. Its annual Grand Gathering event draws crowds of more than 100,000 people, including former politicians from France, the UK, the US, Germany, and Canada. In an attempt to curb the rise of the MEK the mullahs have spent millions on demonization campaigns across the Middle East region and beyond. It has also orchestrated several terror plots against the MEK and its members. A recent plot to attack the MEK’s Grand Gathering event with a car laden with explosives was foiled in the final stages by European law enforcement. With the introduction of the latest round of sanction, the Iranian regime is in a panic. The Guardian article can be seen as a knee-jerk response to rising inflation, increasing public unrest, and the rising clamour for regime change inside Iran. Iran Human Rights Monitor has documented an increase in executions and human rights abuses within Iran as the mullahs attempt to get a grip on the situation. 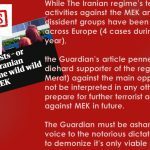 In publishing an article like Aaron Merat’s on Friday, the Guardian is aiding and abetting the Iranian terror network by legitimizing its attacks on the MEK. It also discredits itself as a bastion of free and independent journalism. The mullahs use of the international press to attack its opponents will not save them. The regime’s days are numbered. Strikes are spreading across the country as a result of the repressive and inhumane policies of the ruling elite, while the regime is engulfed by deadly crises, Iran’s key sectors are crippled, and the national economy is only set to further decline. The Iranian people are ready for change. No amount of regime propaganda in the international media can change their minds.